Lok Sabha Elections 2019: Varun Gandhi has not been on very good terms with the BJP since he went public with his criticism of the leadership. He was also denied any big role in the BJP. 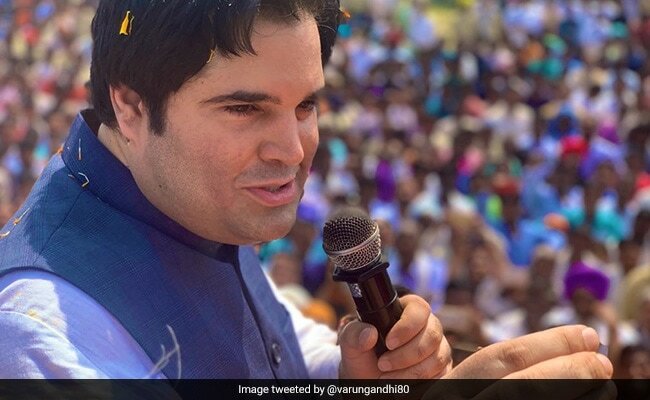 Lok Sabha Elections 2019: Varun Gandhi is fighting the election from Uttar Pradesh's Pilibhit. BJP parliamentarian Varun Gandhi's fulsome praise for Prime Minister Narendra Modi on Sunday came with a portion of criticism for prime ministers from his own family, a group that includes his great-grandfather Jawaharlal Nehru, grandmother Indira Gandhi and uncle Rajiv Gandhi. No prime minister in the past had brought as much glory to India as PM Modi had, Varun Gandhi said while campaigning in Pilibhit in Uttar Pradesh, where he is the BJP candidate. "Honestly speaking, some people in my family have been prime ministers too but the kind of prestige PM Modi has brought to India, nobody else has done for the country for a long time. That man is living for the country and he will die for the country. He only thinks about the country," Varun Gandhi said, addressing a public rally. "(Atal Bihari) Vajpayee ji was from a normal family but had never seen abject poverty. Modi ji is from an economically weaker family...In five years, Prime Minister Modi has not a single accusation of corruption. There are no corruption charges on him. For whom would he do corruption when he has no one else in his family," the 39-year-old said, extolling the Prime Minister. Varun Gandhi, the cousin of Congress president Rahul Gandhi, is the youngest of the fifth generation of the Nehru-Gandhi family. His father Sanjay Gandhi was the younger son of Indira Gandhi; Rahul Gandhi's father Rajiv Gandhi was his older brother. Not long after Sanjay Gandhi died in a small plane crash in 1980, his wife Maneka Gandhi broke away from the family along with her infant son Varun. Mother and son are both in the BJP. Varun Gandhi and Maneka Gandhi have swapped constituencies this time. He is fighting the election from Pilibhit while his mother will contest from his Sultanpur constituency. Sources say the change was to ensure safety for Varun Gandhi, who is seen to have lost much support in his own constituency over the years. The BJP leader has not been on very good terms with his party since he went public with his criticism of the leadership. He was also denied any big role in the BJP. Months ago, he embarrassed the BJP when he claimed he received a call from the Prime Minister's Office when he questioned MPs giving themselves salary hikes. Earlier this year, murmurs about Varun Gandhi joining the Congress - not infrequent - cropped up again. Pilibhit will vote on April 23, in the third phase of the Lok Sabha elections that start on Thursday. The results will be declared on May 23.